This article is about the Indiana Jones character. For the Disney Princess, see Elsa. 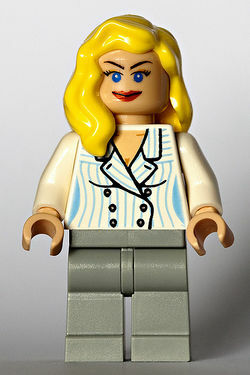 Elsa Schneider is an Indiana Jones Minifigure released in 2009 within one set. The Minifigure is given medium stone grey pants and a double sided torso depicting a white and blue striped suit. It has a cool yellow hairpiece that covers her right shoulder and a double sided head piece. It also made an appearance in LEGO Indiana Jones: The Original Adventures where it appeared with a green jacket, green eyes, and a different new hair piece, probably due to the fact that the other Minifigures, Marion and Willie would have looked almost identical. It also appeared in LEGO Indiana Jones 2: The Adventure Continues, where it is changed to the real appearance, except for the game's new hair piece. Elsa Schneider desired the Grail, and like Donovan, she kept her involvement with the Germans a secret. Although she betrays both Joneses to the Germans, she later has a change of heart and picks out a false grail for Donovan and watches him rapidly age and then decay. Afterwards, she mistakenly crosses the temple's seal with the Grail in hand, causing the temple to collapse as she drops to her death in the resulting abyss when attempting to retrieve the Grail instead of holding onto Indiana. She doesn't die in LEGO Indiana Jones 2: The Adventure Continues, but instead she re-allies with Indiana Jones and his compatriots. She is found playing golf with Henry Jones after Indy and Sallah escape the temple. This page was last edited on 9 January 2016, at 22:01.